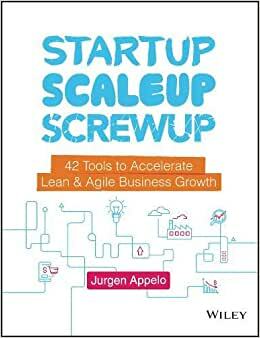 Start reading Startup, Scaleup, Screwup on your Kindle in under a minute. The book's tools and tips are designed to accelerate lean and agile business growth. They cover a diverse and important set of topics, such as: working with a remote team, optimizing workflows, and discovering how to use a North Star Metric and a Journey Map. Ultimately, the author prepares the reader for the date when it all comes crashing down…because one day it will. "A raw and authentic founder's playbook for making the often messy process of starting-up, a lot less messy. Highly recommended." "Startup, Scaleup, Screwup is the definitive toolbox for every leader who is determined to build an organization that keeps getting bigger and better. Jurgen Appelo draws on his extensive experience, wisdom, and sense of fun as he teaches us how to use the Shiftup Business Quilt, Lean Personas, Value Proposition Wheel, Pirate Metrics, and a host of other powerful and useful tools." "This is both a personal story and an exciting collection of new and familiar tools. Founders should not skip this." "The only thing I'm an expert at is learning tons of things that might help me solve my problems, and then sharing my insights publicly along the way. Fortunately, people seem to appreciate that. . . I learned so much this past year from all the research that I performed and all the interviews that I did. I'm convinced that my business is better off now because of the many things I picked up that we could implement right away. I might even suggest that all startup founders write their own books. I would read them for sure."